A beautiful winter scene is the sunset that takes place over a frozen lake in the Churchill Wildlife Management Area in Churchill, Manitoba. Orange and yellow hues adorn the sky above Churchill, Manitoba at sunset during the winter as the last remaining colors glisten across the landscape. A frozen lake spotted with snow is a common sight around Churchill in the winter, but a sunset adds that extra beauty to the area. Sunset over a frozen lake in the Churchill Wildlife Management Area, Churchill, Manitoba, Hudson Bay, Canada. 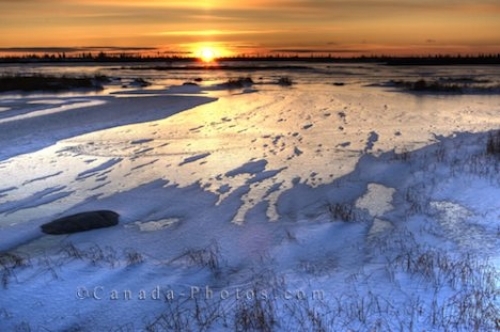 Picture of a beautiful sunset glistening across a frozen lake during the winter season in Churchill, Manitoba.